This past week I’ve been down in artichoke country. Monterey County, to be exact, which is affectionately called “The Salad Bowl of America”. I was down there for a few days learning all about salad, and yesterday drove through miles and miles of pure farmland on my way home. I don’t know about you, but to me there’s nothing more relaxing than driving through the country. It reminds me of home. I love artichokes and after passing so many little roadside stands with names such as “The Thistle Hut” and “Hot Fried ‘Chokes”, I decided to cook some up at home. 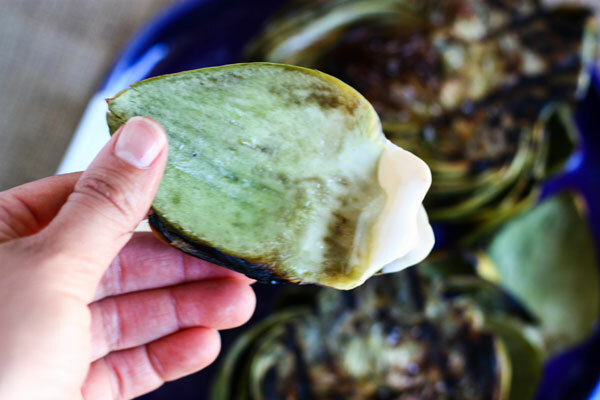 If you’ve never grilled artichokes before, you’re in for a real treat. You always pre-cook the artichokes prior to grilling, and here I boiled mine for twenty minutes first. Then, I just rubbed them with some olive oil and sea salt before placing on the grill. I served these with a spicy lemon aioli and they were just fabulous! The perfect summer side dish, if I do say so myself. 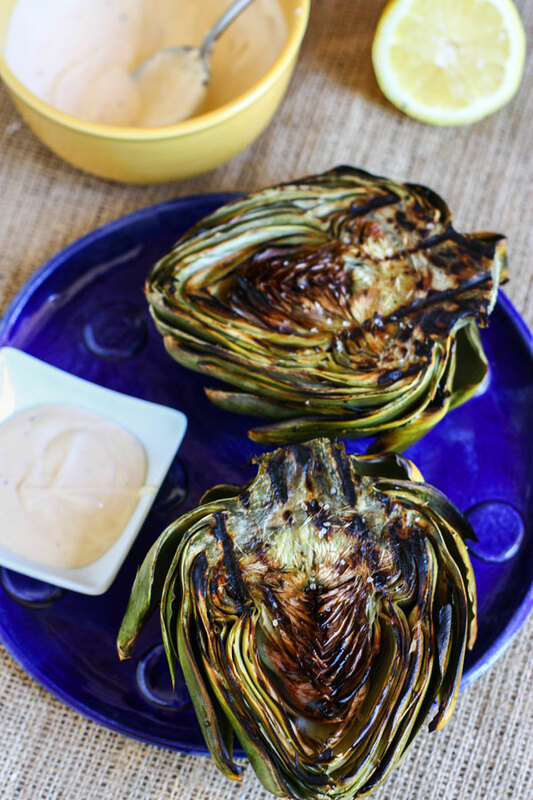 Why just grill any old vegetable when you have Jenna Weber's's recipe for grilled artichokes in a full post on the Fresh Tastes blog. 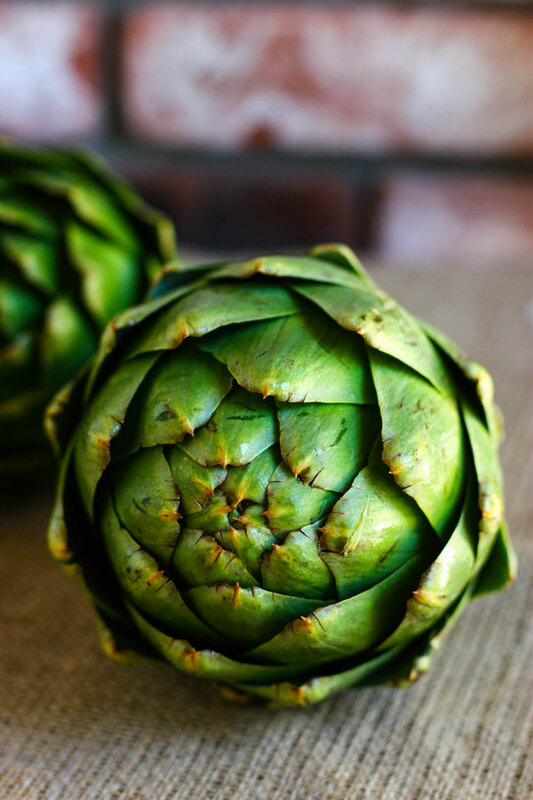 Trim your artichokes by slicing off the bottom “nub” and slicing each in half. Bring a large pot of water to a boil on the stove. Add the juice of 1 lemon to the water, along with a big pinch of salt. Once boiling, carefully drop in the artichokes. Let simmer for 20 minutes. Preheat grill to medium/high while artichokes are simmering. After 20 minutes, remove artichokes from the boiling water and place on paper towels to drain. Drizzle two tbsp olive oil over each artichoke, followed by another big squeeze of lemon juice and a sprinkle of sea salt. Place artichokes on the grill, cut-side down. Close grill and let cook for about 8-10 minutes, checking occasionally. You want the artichokes to get really nice and charred. While the artichokes are grilling, prepare your aioli. Mix together all ingredients and season to taste. When artichokes are tender and charred, remove from the grill, let cool then serve with the spicy lemon aioli.